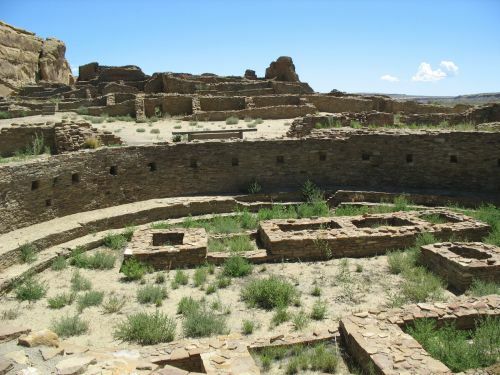 I often end my tour of Pueblo Bonito by describing it as “a place of majesty and a place of mystery.” I’ve recently been thinking about what exactly that means, and what makes Pueblo Bonito, and Chaco Canyon more generally, so mysterious. It’s not really difficult to figure out, but I think the implications are more important than I had realized before. In a nutshell, Chaco is interesting largely because it’s mysterious, and it’s mysterious because it’s in such a harsh environment. It’s clearly a major center of some kind, although it remains unclear exactly what it was the center of, in a place where you would never expect to find anything on so grand a scale. Indeed, the startling contrast between the grandeur of the sites in Chaco and the barrenness of their setting has led some archaeologists, and many visitors, to assume that the climate must have been different when the sites were built. 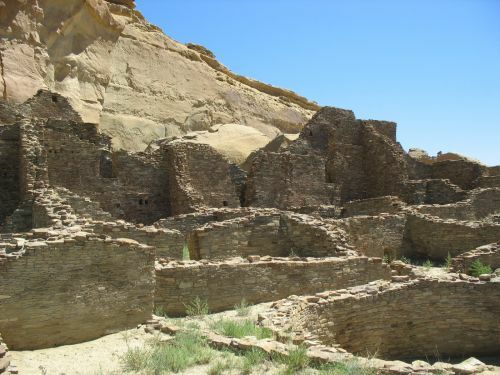 A considerable amount of research has therefore been put into reconstructing the paleoclimate of Chaco, with the surprising result that it hasn’t changed much in the past few thousand years. There have been small variations on the scale of decades in the amount of rainfall, and in such a marginal environment for agriculture even small variations like that could easily make or break a societal system, but they’re really just on the order of the changes seen in recorded history (i.e., over the past hundred years or so), and the place has definitely been more or less like it is today for a long time. 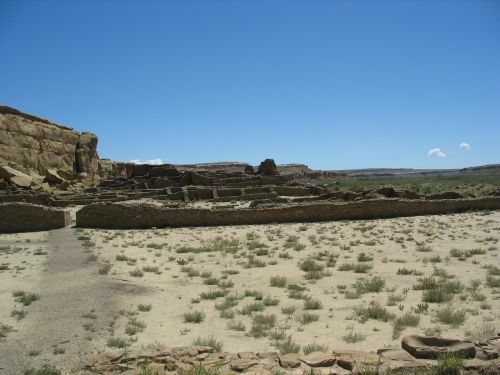 And yet, the great houses are there, as are all the other aspects of the Chaco system that inspire so much wonder and awe today, including the road system, the astronomical alignments, and everything else. In some ways I think the current (somewhat artificial) isolation of the park maintained by the lack of a paved road to it is appropriate in giving a sense of just how much effort it would take to make this an accessible location, let alone a major cultural center. There’s a tradeoff, of course, in that making it easier to get to would probably make it more obvious just how central it was once the required infrastructure was put in. Still, though, there’s no denying that this is a hard place to live, and it’s by no means an obvious location for the scale of construction necessary to create such a center. That’s one of the abiding mysteries of Chaco, perhaps the most fundamental one. Visitors ask about it all the time; “why here?” is one of the most frequent questions we get. I always just say that it remains a mystery. It’s not the mere presence of a major cultural center in the prehistoric Southwest that comprises the mystery, however. 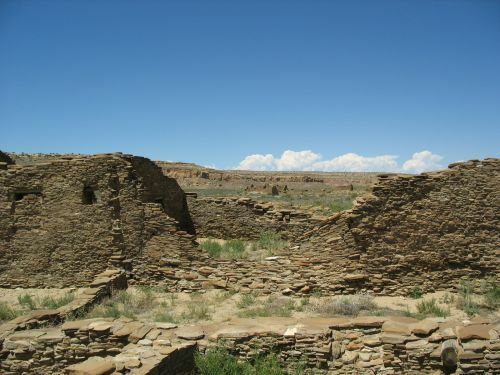 There have been others that have not elicited nearly the interest accorded to Chaco. Aztec, for example, which seems likely to have succeeded Chaco as the center of a somewhat reduced regional system in the twelfth century, is a major center on the same scale, but there’s nothing all that mysterious about it. It’s located right on a major river in a fertile valley well-suited for agriculture, which is exactly where you would expect to find a major population center capable of serving as the center of a widespread system. Other Southwestern archaeological sites are even less mysterious. Mesa Verde is a very good agricultural area by regional standards, as is Bandelier, and it is no surprise that they attracted large prehistoric populations. Canyon de Chelly is a bit of an oasis in a generally harsh area. The Hohokam sites in southern Arizona are along major rivers well-suited for irrigation agriculture. There are also sites in marginal areas, of course, but they tend to be small and unimpressive, which is unsurprising given their surroundings. All of these sorts of sites can be easily explained by reference to fairly simple ecological determinist models of human settlement patterns. Not so with Chaco, however. While many archaeologists have made valiant attempts to fit the rise of Chaco into models based on local and/or regional environmental conditions, they have been generally unsuccessful in finding a model that convincingly explains the astonishing florescence of the Chaco system in the eleventh and early twelfth centuries. This has inspired some other archaeologists more recently to try a different tack involving less environmental determinism and more historical contingency. This seems promising, but finding sufficient evidence for this sort of approach is difficult when it comes to prehistoric societies like Chaco. The various camps of archaeologists will likely continue to argue about the nature of Chaco for a long time, I think. Meanwhile, the mystery remains. I doubt this mystery will ever be totally solved. There’s just too much information that is no longer available for various reasons. That’s not necessarily a problem, though. At this point the mysteries of Chaco are among its most noteworthy characteristics. Sometimes not knowing everything, and accepting that lack of knowledge, is useful in coming to terms with something as impressive, even overwhelming, as Chaco. One way to deal with it all is to stop trying to figure out every detail and to just observe. The experience that results from this approach may have nothing to do with the original intent of the builders of the great houses of Chaco, but then again it may have everything to do with that intent. There’s no way to be sure, and there likely never will be. But that’s okay. Sometimes mysteries are better left unsolved.